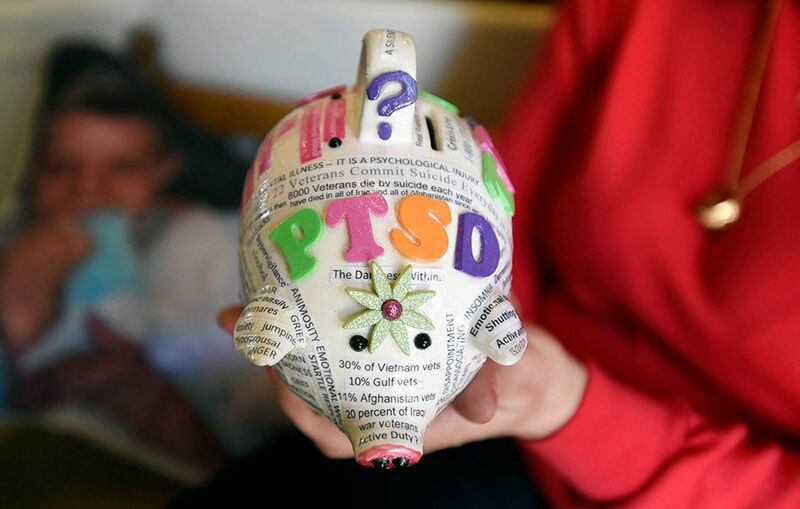 Kim Harter knowns that her PTSD Awareness Pig might strike people as a little goofy. Part of her likes how a thing inspired by tragedy and so heavy with meaning can make people — can make her — smile. Levity, however, is not the point. The six-inch ceramic figure started out as an unadorned piggy bank, the designated canvas for an art contest Kim saw advertised in a U.S. Air Force hobby shop in Colorado Springs about a year after the death of her son, U.S. Marine Corps veteran Noah Harter. Now emblazoned with maybe a hundred swatches of text-covered paper referencing the symptoms, causes, effects, and outcomes for PTSD, the contest entry became an art therapy project that helped Kim wrap her head around a diagnosis she wishes she’d understood more fully before her son took his own life, in May 2015. Today, she uses the pig to illustrate a complex story and to highlight the nonprofit, community resources — local and nationwide — that she believes might have helped save her son’s life. “There are groups, people and places for veterans with PTSD to turn to in crisis, and maybe if Noah had known about them what happened to him wouldn’t have happened,” Kim said. U.S. Marine Corps veteran Derek Cirilo started this Texas-based organization after realizing that he’d lost more of his men to suicide than in combat during Operation Iraqi Freedom and Operation Enduring Freedom. The nonprofit is staffed full-time by volunteers who are military veterans and are on-call, 24-hours a day, to answer a crisis hotline. The organization offers such things as emergency financial assistance, help with VA benefits and transitioning, and has a network of satellite chapters — including one in Colorado Springs — providing support, advocacy and connecting veterans on the local front. Inspired by the nonprofit wellness and community center he founded in his home city of Trinidad, U.S. Marine Corps veteran and entrepreneur Jay Cimino expanded the concept to Colorado Springs in 2016 with a project focusing on services for men and women serving in the military, veterans (regardless of discharge status) and their families. The center provides access to a range of resources, including a nationally-recognized transition-to-work program, classes, “Peer Navigators” and behavioral health and wellness services such as support groups, life coaching and counseling. Eligible clients don’t need a referral or insurance; a donation of $10 is requested. Founded by Vietnam veteran Bill Galvan as a resource hub augmenting community support services currently in place for those who served in the military, the organization is focused on eradicating the veteran suicide rate as well as addressing the population’s homeless and medical problems, including management of Traumatic Brain Injury and PTSD, and providing one-on-one support in times of despair. The group currently is undergoing restructuring and seeking donations to help in the purchase of Southern Colorado ranch land for the construction of transitional and permanent housing for veterans. Started by a Florida mother, Janine Lutz, whose son took his own life after returning from service in Iraq, the LCpl Janos V. Lutz Live to Tell Foundation was established to connect the “casualties of PTSD,” including those who served in the military as well as police and other first responders. Projects include the nation’s only Mobile Post-Traumatic Stress Memorial wall and the “Buddy Up” program, an online (and real-world, in Florida) social club aimed at supplying the critical camaraderie component. The foundation is in the process of producing a downloadable app that will connect users with veteran-owned businesses and available free services in their area. The app also will let users see other members in close proximity, issue an alert to designated “buddies” on select anniversary or trigger dates and send out a code red or yellow alert in the event of crisis.